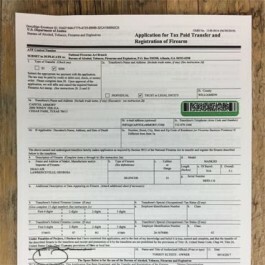 Capitol Armory has filed tens of thousands of Form 4s for our Texas customers and now our out of state customers can benefit from our experience and technology too! 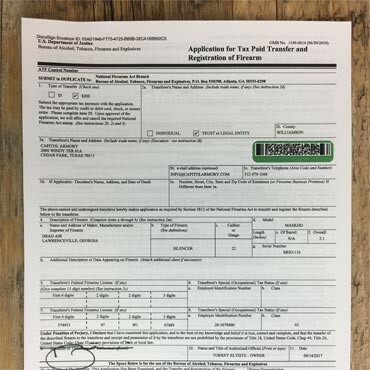 Add this service to your cart and Capitol Armory will prepare your Form 4 paperwork and include it with your NFA item when it ships to your local dealer. The packet will include your completed forms along with your fingerprints, photos, and trust (if applicable) so that you have the entire package to make the Form 4 transfer process easy and error free. All you'll have to do is attach a $200 check for the tax stamp and drop it in the mail. Submit your fingerprints and photo to us once and we will keep them on file so that any subsequent purchases only require your electronic signature to complete your Form 4 packet. This service is 100% FREE to any customer purchasing through Capitol Armory. *TX Residents - We automatically provide this service for you so this item does not need to be added to your cart. This is an optional service for our out of state customers. Add this item if you'd like Capitol Armory to include a $200 check with the paperwork packet. There is no time limit on your end. There may be some things you need to do or plan to, so buying now and receiving those instructions ahead of time may help to prepare.